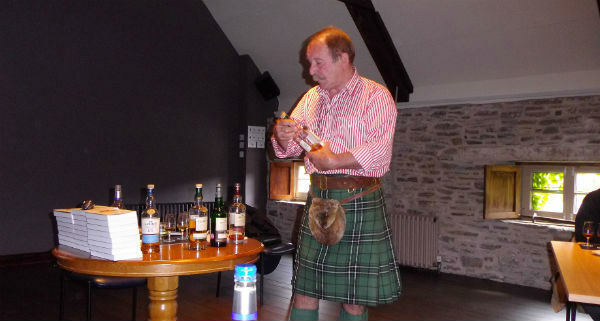 MCLEANSCOTLAND offer the best whisky tours you can find, it’s no secret. It’s also no secret we are based in Perth. Perth and the whisky trade – we had 44 distilleries in 1819, way before I was even a flicker in my gg grandfather’s eye. As Scotland’s tourist trade heightened Perth became a stopping-off point for middle class travellers heading north. It still is today, to a lesser extent. Among the 44 were Arthur Bell, John Dewar and Matthew Gloag. All started blending whisky, Thomas Sandeman opened a wine and spirit merchant in Kirkside selling, among other things, his relative George’s, new range of port wines (one of our largest pubs now is Sandemans). Matthew Gloag (there is a wee bar and restaurant I use) was a butler at Scone Palace. He then butlered (is that a word?) for the Sheriff Clerk of Perthshire, met his wife Margaret Brown and in 1831 Margaret applied for a licence to sell wines and spirits in the shop below their home in Atholl Street. Four years later, Matthew joined the business full time. Sneaky wee man. Matthew was asked to supply the wines and spirits for a banquet held to celebrate Queen Victoria and Prince Albert’s royal visit to Perthshire. Sadly, the event never took place, but nice to be asked. In 1828 John Dewar had moved from Glen Lyon to Perth to take up a position as cellar man at his relative Alex McDonald’s wine and spirit merchant in Castle Gable (don’t think this exists now). In 1846 John opened his own shop and bonded warehouse at 111 High Street. The firm would stay there for the next 54 years. I used to live just doon the road at 163 High Street – not at the same time. All these famous names eh! The railway came to Perth in 1848 bringing more tourists and –over the next 20 years the railway would rail itself up to Speyside, meaning more distilleries to be built – so all you fans of these distilleries, see what Perth did! Casks of the golden liquid whisky were shipped south. Perth is where the railway lines split to go to Glasgow or Edinburgh, was now a railway whisky hub. In 1870, William B Gloag took over his dad’s business, now in Kinnoull Street, his son Matthew took over in 1896, making blends of high quality – though sales were still mainly local. The Grouse Brand (as it was first named) appeared in 1897. John Dewar & Sons, (Tommy and John Alexander) was now one of the three major blending houses (after John Walker and James Buchanan). Its High Street base was now too small and, in 1894, moved to a large site next to the railway, where whisky was bonded, blended and bottled. J A Dewar (who became Lord Forteviot in 1916) served as Perth’s Lord Provost, a liberal MP for Invernesshire, cleared the city’s slums, built its’ gas works and established the charitable Forteviot Trust. When he died in 1929, his obituary read: ‘In many respects Lord Forteviot was the greatest man that Perth has ever produced.’ His brother Tommy donated Kinnoull Hill to the city.It’s a wooded hill with a wee silly tower built at the top, sadly jumpers like it. Arthur Bell’s son, A K, founded the Gannochy Trust, he also improved the town’s water supply, and as a keen cricketer provided a cricket pitch and pavilion for the city, as wee Scots are so well known for our outstanding cricket prowess. He also developed a woodland park at Scone. Edrington, now owner of The Famous Grouse, is run by the Robertson Trust, a charitable foundation.Dewar’s joined DCL in 1925 – Bell’s began to buy distilleries, Blair Athol, Dufftown, then Inchgower. Dewar’s was continuing its growth. In 1958, it moved to a massive, 26-acre site on the outskirts of Perth at Inveralmond, which at its height employed 800 people. On the death of Fred Gloag and his wife, Matthew Gloag became part of Highland Distillers, The Famous Grouse started to be promoted as a premium blend. Inside ten years it was selling 1m cases. By the 1980s, Dewar’s was one of the world’s top-selling blends, Bell’s dominated the UK market and was looking to export, The Famous Grouse had become Scotland’s favourite blend. Perth could claim to be Scotland’s most successful whisky city. Thanks for all this info cuz (Charlie Maclean). All that remains of Perth’s whisky heritage reside in the charitable foundations set up by its whisky barons. I have tried (in vein) to persuade the local council to open a whisky museum, have also tried getting whisky festivals here (only Excel Wines have had any luck with this, well done to them), so really, if you think about it – the only whisky industry still here is … MCLEANSCOTLAND whisky tour company! Providing nation – wide (and Ireland) bespoke whisky tours for the whisky fans around the world, aye – we are busy still, with whisky here in Perth. Paul McLean wrote this drivel nearby the North Inch, Perth – that’s another story; Perth, officially the smallest city in the world.